Successfully Added 1.3 Inch Watch Phone - Bluetooth, One IMEI, Heart Rate Monitor, Sleep Monitor, Pedometer, Calorie Counter, Sedentary Reminder to your Shopping Cart. Keep track of your exercise levels and work towards a healthier lifestyle with this all in one smart sports watch. Not only does this Bluetooth smart watch motivate you during your upcoming workouts, it also allows you to sync it with your smartphone and to enjoy all your phone’s features directly from your wrist. Answer or reject incoming calls, receive messages, or reply to your social media notifications – with this watch phone your possibilities will be endless. 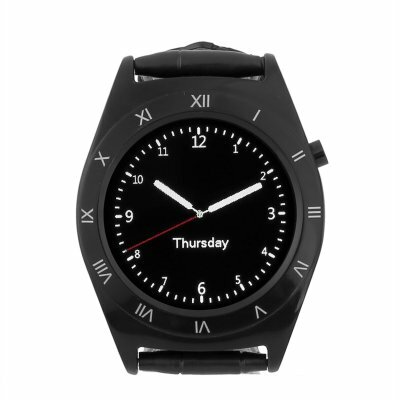 Allowing you to insert a SIM card, this phone watch supports all the same features one would normally find on your smartphone. A built-in mic and speaker allow you to make convenient phone calls, and thanks to its 1.3-inch touchscreen you will be able to easily answer messages straight from your wrist. Bluetooth support additionally allows you to sync your smart watch with your smartphone, taking away the need to have your phone at hand at all time. Thanks to the latest IPS display technology this sport watch lets you enjoy clear and bright images, allowing you to clearly read the information displayed on the screen even while you’re located outside in the bright sunlight. Featuring a sophisticated pedometer, heart rate tracker, calorie counter, and sleep monitor this watch phone is the perfect health accessory that motivates you to get through your upcoming workouts. With this electronic gadget at your wrist, you will be capable to accurately keep track of your activity and the energy burned throughout your workouts. A sophisticated heart rate monitor furthermore keeps track of your heartbeat, allowing you to analyze your workouts in more depth – giving you the possibility to take the most out of them and increase your strength and stamina rapidly. Not only does this smart watch support you throughout your workouts, it also features a sleep monitor that makes sure you’ll get enough sleep and rest in between exercise to stimulate healthy recovery. With an external memory up to 32GB you can be assured that this watch phone offers plenty of space for you to save all your personal files. When synced with your Bluetooth headset this sport watch additionally allows you to listen to all your favorite tracks while working out, further stimulating you to hit those health targets. With its 380mAh battery, it will provide you with 2 hours if usage time, enough to enjoy your songs and get through the most demanding of workouts without needing to worry about battery life. Additionally, this Bluetooth smartwatch also features an anti-loss function when synced with your Android phone, guaranteeing that you’ll always be able to find back your smart watch in case you managed to lose track of it.